Poplars (Populus spp.) are a large group of temperate climate hardwood trees that are widely planted in the home landscape. They are known for their fast growth rate, trim and tidy form, and general vigor and adaptability. 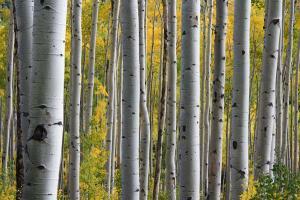 The Populus genus includes a number of common trees that do not go by the common name of poplars, but are certainly considered poplars from a botanical perspective - aspens and cottonwoods, for example. 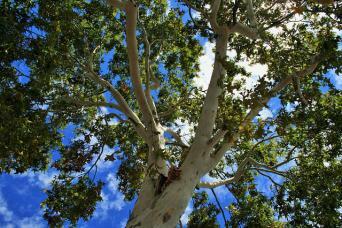 There are also trees that use the name poplar but are not related to true poplars, such as tulip poplar. The vast majority of poplars are found growing in riparian areas or bottomlands where the rich soil and high water table are key ingredients to their rapid growth rate. They are in the same family as willows and are often found growing alongside these fellow water-lovers. Like willows, they form roots easily from any portion of the plant that come into contact with soil. This makes it very easy to propagate poplars by cuttings - simply stick a small branch in the ground and more than likely it will grow. This trait also means that the trees to tend to sprout from their roots in an effort to colonize all suitable ground, which can be a bit of a maintenance challenge. And they also share the trait with willows of immensely powerful roots that can destroy foundations, sidewalks and infiltrate sewer and water lines in their search for water. The appearance of poplars varies considerably but most are known for having very attractive bark that is smooth to the touch and light grey or white, along with large spade-shaped or lobed leaves that turn golden yellow in fall. 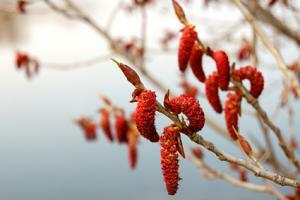 Flowers are in the form of elongated catkins which emerge in early spring just before or as the leaves are coming out, making graceful decorations on the branches. 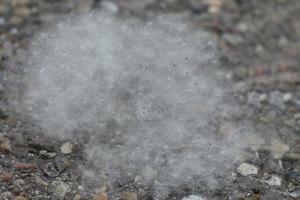 The seeds of most species are tiny and come surrounded by a cottony fluff (hence the name cottonwood) which blows all over the place and can completely cover the ground. 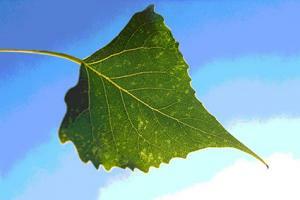 There are 20-plus species of poplar, but gardeners are generally interested in only a few of these, depending on their specific needs and the type of habitat they are gardening in. Cottonwoods are typically very large, reaching 80 to 150 feet in height and are an excellent choice for places where the ground remains constantly moist; their growth habit can be somewhat invasive in nature with roots that completely fill the soil, making it difficult for most other plants to grow. Aspens are the smallest of the poplars, usually growing to less than 50 feet in height and most at home in northern latitudes and higher elevations; the bark on most species is nearly white and the small leaves (for a poplar at 2 to 3 inches) hang loosely from the branches and flutter enchantingly in the wind. Black Poplar grows quickly to 100 feet or more, but lacks the smooth bark and whitish color of white poplars; the species is notable primarily for a cultivar called Lombardy poplar which has an extremely columnar growth habit with a canopy breadth of less than ten feet wide. White Poplar is an exquisite ornamental species with silvery white undersides on the leaves that shimmer in the wind and smooth, light-colored bark with a unique diamond pattern; they grow well in moist places, but can be easily grown as a shade tree in average garden soil, reaching up to 80 feet in height in the time that most shade trees take to reach half that size. Hybrid Poplars are the fastest-growing poplars of all, capable of developing into a full size shade tree in less than a decade; they have a very uniform appearance and assume all the best ornamental traits of white poplar, which is used as one of the parents. Poplars grow well in full sun or partial shade and need rich soil and constant moisture to thrive, except for aspens, which grow well in rocky, well-drained places. Some nurseries sell poplars as bare root specimens in late winter, which is an ideal way to plant them, though containerized trees can be put in the ground at any time of year, as long as irrigation can be reliably provided to help them get established. Pruning and staking are generally not necessary. Besides irrigation, removing root sprouts and pulling out unwanted seedlings is the primary maintenance needed. As noted previously, it's important to plant poplars well away from the house or any paved surface or water, drain or sewer line - 50 feet from any of these is an ideal buffer zone - to prevent damage from the roots. Some people consider the cottony seed balls to be a nuisance, but others find it enchanting. 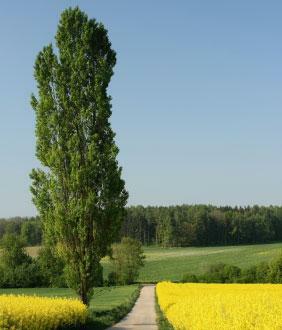 Poplars are affected by a long list of pests and disease. The trees can bear most of these infestations without permanent damage, though in severe cases treatment may be necessary to save the life of the tree. It is not feasible for homeowners to treat trees of this size, making it a job best left to professional arborists. Infected limbs may need to be removed, pesticides administered and nutrient drenches applied. Sometimes, however, the best thing to do is to remove a severely infested tree to keep the disease from spreading to other poplars nearby. 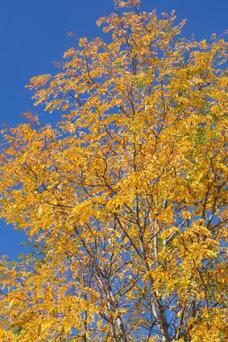 Lombardy poplars are considered especially disease prone, as is any poplar that is stressed by drought. 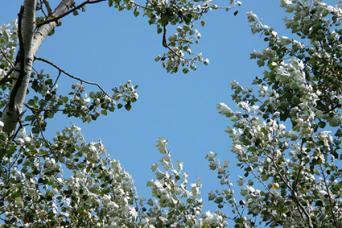 Along with oaks, maples and elms, poplars are among the iconic hardwoods of temperate climates. They grow mush faster than any of the aforementioned species, making them a great choice for a shade tree on larger properties, especially those with a pond, stream, seep or other natural water source.